Automatic invoice billing makes your work easy and effective. No limits for creating booths and Flexible Reporting. Monitor real time online calls status. Easy management for uploading Selleing or Termination Rates. Expand your bussiness with Better Quality Solution. Rates gets displayed in the booth for each destination. Callshop solution is a revolutionary technique to perform phone calls using voice over internet call instead of traditional phone lines. Callshop System is like an internet cafe, where different cabins or booths are connected with IP phones, from which clients can make universal calls. It is completely managed by extensive web interface under VoIP, which enable to manage multiple callshop networks from a single account. Supports realtime billing so calls will not be go through if balance is low. Support both kind of billing for all kind of customers. Supports multiple callshop booths in one system, so you can create several booths in one account. Calculates profit automatically after deducing buying price from selling price and shows profit for each call. Advance reporting system gives you ease to analyze activities in detail. Check all kind of transactions incoming or outgoing from all ways. Put your margin with simple steps. Supports Multiple Calls Management to ease your high call volume. How can I start my Callshop business? What all I need to start my business? You just need termination provider and you can start it immediately. Is there any limitation in booth creation? There is no limitation, you can create as many booths as you want. Will I get Admin Access so I can create my resellers? Yes, you will get Admin Access and you can create multiple resellers in the system. 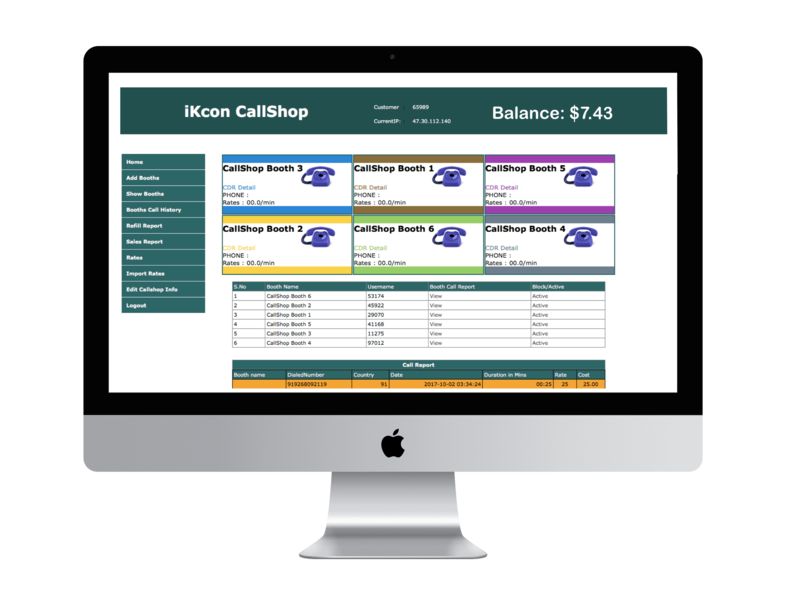 Yes, iKcon Callshop supports Multicurrency system.